In the heart of the city, the location of this three-star property is perfect for families, couples, honeymooners and groups alike. London Creek is a part of the AR Group of Companies, strategically located so as to be within walking distance of major city attractions. You can select your boarding options between bed and breakfast and half-board. Its 105 guestrooms are divided into studio and one bedroom apartments. The studio apartments come with a choice of single and double occupancy. All rooms are elegantly decorated with warm and inviting interior with plush carpets and thick curtains over nice sized windows overlooking the beautiful city of Dubai. 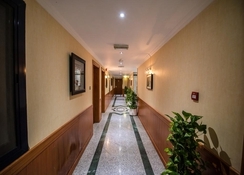 The apartments are fitted with air conditioning, coffee maker, ironing board, satellite TV, work desk, private bathroom with bathing amenities, telephone, inbuilt safe deposit and hairdryer (on request). The kitchen is equipped with cookware and crockery, and a stovetop, microwave and refrigerator (on request). A 24/7 room service and daily housekeeping also ensure a pleasant stay. There are a few more facilities which can be availed at local charges, such as extra beds, WiFi, etc., while a few such as cribs, laundry services are made available on request. In addition to the self-catering facilities available in each apartment, the hotel also features an a la carte restaurant which serves local and international food with a choice of drinks in indoor settings. 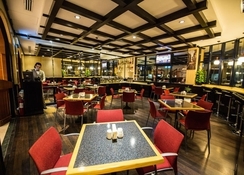 There is an on-site coffee bar which serves light snacks with beverages and is open round the clock. The recreational activities within the hotel complex include an outdoor swimming pool on the roof top, sun deck with loungers, sauna, Jacuzzi, and a fitness centre with basic facilities. However, there is plenty to do in the surroundings. The hotel is neighbourhood to many night clubs and bars, restaurants and cafes where you can enjoy local drinks and food. A night out in the beautiful Desert Safari is a must when you are in the area. The sand dunes are a treat to the eyes around dusk. So is a cruise tour across the Dubai Creek. There are many cities you would like to take a tour too, such as Abu Dhabi, Ras Al Khaimah, etc. 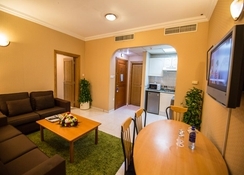 The apartment complex is located about 10 km away from the Dubai International Airport. The location and proximity with a metro station makes this property an ideal destination. While staying at London Creek Hotel, you may like to visit celebrated destinations such as Jumeirah Beach Park (11 km), desert safari (19 km), Dubai World Trade Centre (4 km), and Dubai Creek (12 km). Dubai is a paradise for shoppers and you would not want to miss out on Bur Juman shopping complex about 15 minute (1.3 km) from the hotel. There are many other attractions such as Dubai Museum, Grand Mosque, Dubai Heritage Village and Dubai International Convention and Exhibition Centre within walking distance and definitely worth visiting. Those who want to venture further can also visit Sharjah (25 km), Ajman (33 km) and Umm Al Quwain (62 km). *There is a mandatory tourism tax of AED 10 per room per night.